서명/저자 Comparative analyses of operating hours and working times in the European Union / ed. by Lei Delsen ; Frank Bauer ; Gilbert Cette ; Mark Smith. 발행사항 Heidelberg : London : Physica-Verlag , 2009. 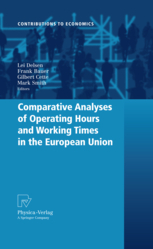 This volume is the second book based on comparative and comprehensive data from the 2003 representative European Union Company survey of Operating hours, Working times and Employment (EUCOWE) in France, Germany, the Netherlands, Portugal, Spain and the United Kingdom. The EUCOWE project is the first representative and standardised European company survey which covers all categories of firm sizes and all sectors of the economy. This volume complements and builds on the first book published in 2007, in which the methodology and the descriptive national findings as well as some first comparative analytical results were presented. In this second book the EUCOWE research team presents in-depth cross-country analyses of the relationship between operating hours, working times and employment in the European Union. Six empirical chapters of this volume provide detailed comparative analyses of the determinants and consequences of the duration and flexibility of opening hours and operating times.